Together we can stop it. More often than you realize. 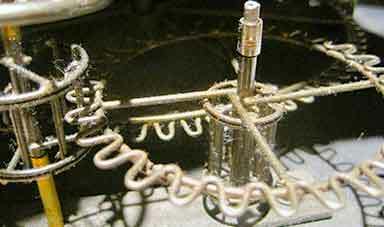 Recognize TDV before it's too late. Whether you are a student working on a school project about teen dating violence - or a parent looking for a way to talk with your teen about the difference between healthy and unhealthy behavior in a relationship - or a teacher working on a lesson plan for your health students, there are many free resources to help you #stopTDV including roleplaying activities, printable posters, and video games. Since 2006 we have been working to #stopTDV and we need your help. We rely 100% on donations to increase awareness and provide educational information about teen dating violence. You can make a donation online safely and securely - right now - and will instantly receive a receipt for tax purposes. Thank you for helping us #stopTDV. 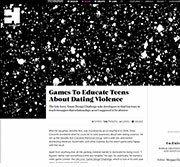 At GDC 2015, Drew Crecente of Jennifer Ann's Group spoke about the power of video games to prevent teen dating violence (TDV). TDV is scarily prevalent, and Jennifer Ann's group is a non-profit organization that works with teens in order to prevent it. Since 2008, the group has used video games to educate and raise awareness. In the talk, Crecente argued that video games may actually be the most effective pedagogical tool to prevent TDV. "Evidence-based research supports the efficacy," of video games as a tool for preventing partner violence in teens, said Crecente. 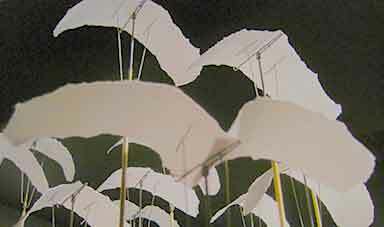 They can be used to experiential learning and empathy-building, and they speak to teens in a language they understand. 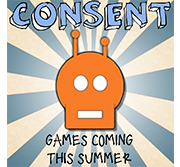 The award-winning video games about consent have been announced! The winning games are: 'Stuck in a Dark Place' from Another Kind in Belgium; 'Crossing Boundaries' from Testudo Games in UK; 'How to Blorrble-Blobble' from Jared Sain in USA; and 'Adrift' from Carrie Crossley and Andrew Connell in USA. The games will be released to the public during July. Teen dating violence awareness charity Jennifer Ann’s Group has released the first-place winning entry in its 8th annual Life.Love. Game Design Challenge. 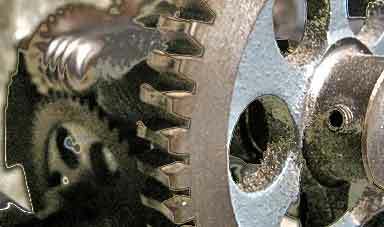 The winners were announced in June. The Life.Love. Game Design Challenge encouraged game developers to create a game the promotes education and awareness on teen dating violence and prevention. 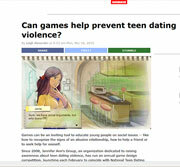 Can games help prevent teen dating violence? Games can be an inviting tool to educate young people on social issues -- like how to recognize the signs of an abusive relationship, how to help a friend or to seek help for oneself. Since 2008, Jennifer Ann's Group, an organization dedicated to raising awareness about teen dating violence, has run an annual game design competition, launching each February to coincide with National Teen Dating Violence Awareness and Prevention Month (I've acted as a competition judge in a couple of the years). Last year's winner, The Guardian, is available on the Android store. 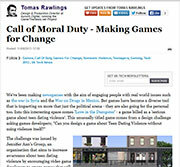 Video games are often criticized for glamourizing murder, drug abuse and other criminal behavior. 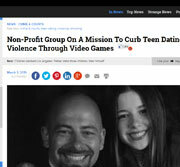 However, for Jennifer Ann’s Group, founder Drew Crecente wants to change the perception of video games by showing that they can be an effective way to reach today’s youth and teach them about the seriousness of teen dating violence. With February deemed ‘Teen Dating Violence Awareness Month,’ Atlanta native Drew Crecente is on a mission to save lives. Dating violence among teens is alive and real, and the statistics show a startling trend. In Georgia, the rates of teen dating violence mirror national statistics from the CDC with nearly 13 percent of females and 12 percent of males in high school reporting being physically hurt by someone they were dating. 'It’s a problem that many people do not want to think about, and so it is not discussed as often as it should be,' stated Drew Crecente of Atlanta. 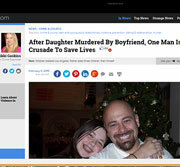 Teen dating violence is a pervasive problem that affects millions of adolescents worldwide. Although there have been various approaches to addressing this problem, using videogames had not been employed before 2008, when Jennifer Ann's Group, an Atlanta, GA–based nonprofit organization, created an annual competition. The Life.Love. Game Design Challenge rewards game developers for creating videogames about teen dating violence without using any violence in the games themselves. The resulting videogames have increased awareness about teen dating violence and provided educational information to assist adolescents, parents, and teachers in identifying abusive relationships. Across the country there is exciting and innovative work being done to address teen dating abuse! This summer, our National Youth Advisory Board sifted through dozens of nominations and selected the top 10 Trailblazers. These Trailblazers are programs our NYAB found to resonate with youth experiences of relationships and were innovative in their approach, outreach, or youth activism. Each week of TDVAM we will feature programs that deserve recognition for this work, and encourage you to share these ideas with your own organizations or local activists. This spring, submit your local program on Break the Cycle’s website for our National Youth Advisory Board’s selection of a second year of Trailblazers! We've been making newsgames with the aim of engaging people with real world issues such as the war in Syria and the War on Drugs in Mexico. But games have become a diverse tool that is impacting on more that just the political arena - they are also going for the personal too. 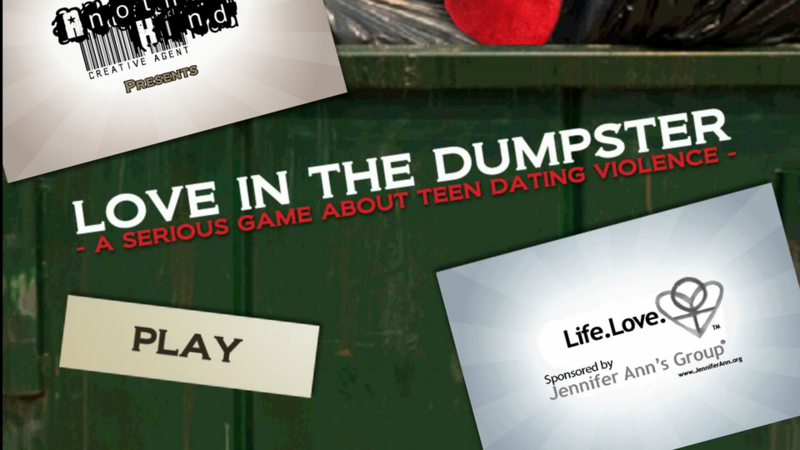 Into this interesting space comes 'Love in the Dumpster' - a game billed as a 'serious game about teen dating violence'. This unusually titled game comes from a design challenge asking games developers; "Can you design a game about Teen Dating Violence without using violence itself?" The sixth annual Life. Love. 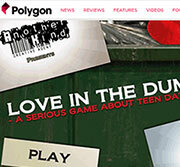 Game Design Challenge, aimed at increasing awareness of teen dating violence, has announced its winning entries. Overall winner is Love in the Dumpster by Jean Hehn of Belgium, followed by Janie's Sketchbook by Guts Rodsavas and Piti Yindee of GPTouch in Thailand. In third place is YourSpace by Paul McGee, Sam Gross, Lyndsey Moulds, Ross McWilliam and Kayfaraday in Ireland followed by What Kind of Monster is your Boyfriend? by 99Uno in Argentina. The Life.Love. Game Design Challenge asks developers to find fun ways to teach teenagers that relationships aren’t supposed to be abusive. (The games are) more immersive than the average page of text, and they make a point with younger viewers who are wary, or bored, with top-down messages. "It’s something they can explore on their own. If they are sitting in a class in high school, they might feel uncomfortable raising their hand, and asking about the specific effect of an abusive relationship. It carries more weight if they see the game through the eyes of the protagonist. They can identify with that person, and it’s a dynamic experience." 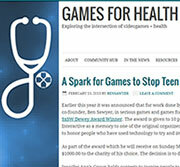 Earlier this year it was announced that for work done by Games for Health Project co-founder, Ben Sawyer, in serious games and games for health that he will be a SxSW Dewey Award Winner. The award is given to 10 people each year by SxSW Interactive as a memory to one of the original organizers of the event, Dewey Winburne. It is used to honor people who have used technology to try and improve the lives of others. As part of the award which he will receive on Sunday March 10 in Austin SxSW is donating $1000.00 to the charity of his choice. 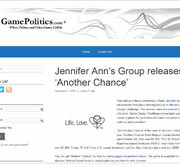 The decision is to donate the funds to Jennifer Ann’s Group. According to a 2009 study by the CDC, 10% of teens report having been physically abused within the past year by a dating partner. By the time students have graduated from college 44% of them will have been in an abusive relationship. A 2007 survey revealed that one-third of teens say they have received up to thirty text messages in one hour by their dating partner demanding to know where they are, who they are with, or what they are doing.Horror stories include a 16-year-old whose ex-boyfriend paid four friends to help him send abusive text messages while he was asleep or at work. Unfortunately it's not easy to define what is abusive. 'If you're getting 50 messages an hour and you want 50 messages an hour, that's not a problem,' says Marjorie Gilberg, executive director of Break the Cycle, 'But if you're getting 50 messages an hour and you don't even want one, that's very different.' It's also important to note that the phone that a teen was given by his or her parents may not be the only phone they have; one in six teens have been in a relationship where their partner has bought a cell phone or minutes for them. A 2009 study by MTV and the Associated Press revealed that over ten percent of the teens surveyed had previously had a boyfriend or girlfriend demand to hand over their password. Further, 68% of those that shared their passwords have been a target of abuse via technology as compared to 44% of those who had not shared their passwords. Additionally, nearly one in five (18%) teens say their dating partner used a networking site like Facebook or MySpace to harass them . . . This is an awareness campaign from Jennifer Ann's Group, an Atlanta-based nonprofit organization preventing teen dating violence through awareness, education, and advocacy (+video games!). That's right, we said video games - and they're available to play online - for free - right now.